There can be multiple causes from deleting the original SSL certificate to your server crashing and not having a backup of the private key. Log on to the computer that issued the certificate request by using an account that has administrative permissions. Click Start, click Run, type mmc, and then click OK. In the Certificates snap-in dialog box, click Computer account, and then click Next. In the Select Computer dialog box, click Local computer: (the computer this console is running on), and then click Finish. In the Certificates snap-in, expand Certificates, right-click the Personal folder, point to All Tasks, and then click Import. On the File to Import page, click Browse. In the Open dialog box, click the new certificate, click Open, and then click Next. On the Certificate Store page, click Place all certificates in the following store, and then click Browse. In the Select Certificate Store dialog box, click Personal, click OK, click Next, and then click Finish. In the Certificates snap-in, double-click the imported certificate that is in the Personal folder. 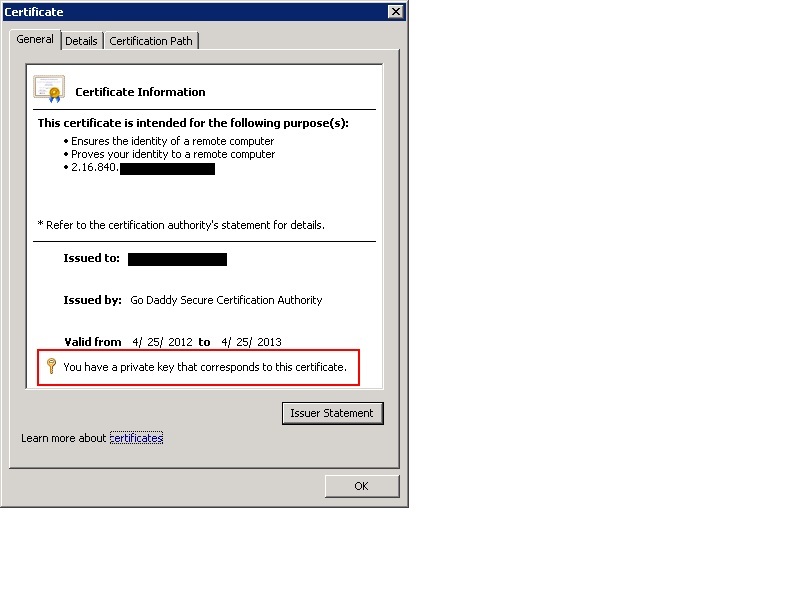 In the Certificate dialog box, click the Details tab. Click Serial Number in the Field column of the Details tab, highlight the serial number, and then write down the serial number. NOTE: SerialNumber is the serial number that you wrote down in step 17. In the Certificates snap-in, right-click Certificates, and then click Refresh.